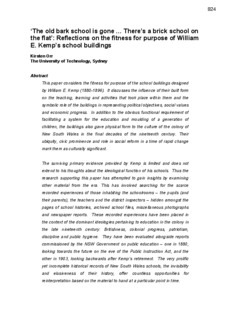 This paper considers the fitness for purpose of the school buildings designed by William E. Kemp (1880-1896). It discusses the influence of their built form on the teaching, learning and activities that took place within them and the symbolic role of the buildings in representing political objectives, social values and economic progress. In addition to the obvious functional requirement of facilitating a system for the education and moulding of a generation of children, the buildings also gave physical form to the culture of the colony of New South Wales in the final decades of the nineteenth century. Their ubiquity, civic prominence and role in social reform in a time of rapid change mark them as culturally significant. The surviving primary evidence provided by Kemp is limited and does not extend to his thoughts about the ideological function of his schools. Thus the research supporting this paper has attempted to gain insights by examining other material from the era. This has involved searching for the scarce recorded experiences of those inhabiting the schoolrooms – the pupils (and their parents), the teachers and the district inspectors – hidden amongst the pages of school histories, archived school files, miscellaneous photographs and newspaper reports. These recorded experiences have been placed in the context of the dominant ideologies pertaining to education in the colony in the late nineteenth century: Britishness, colonial progress, patriotism, discipline and public hygiene. They have been evaluated alongside reports commissioned by the NSW Government on public education – one in 1880, looking towards the future on the eve of the Public Instruction Act, and the other in 1903, looking backwards after Kemp’s retirement. The very prolific yet incomplete historical records of New South Wales schools, the invisibility and elusiveness of their history, offer countless opportunities for reinterpretation based on the material to hand at a particular point in time.